Located within walking distance from the base of Mt Maunganui (Mauao) , this apartment is close to everything that there is to love about this top holiday destination. Within walking distance is the main beach voted as the No 1 in New Zealand by Tripadviser for 2017. Also just a stroll away are cafes, restaurants, parks and downtown! And in the summer months there's a night market a stroll away as well. 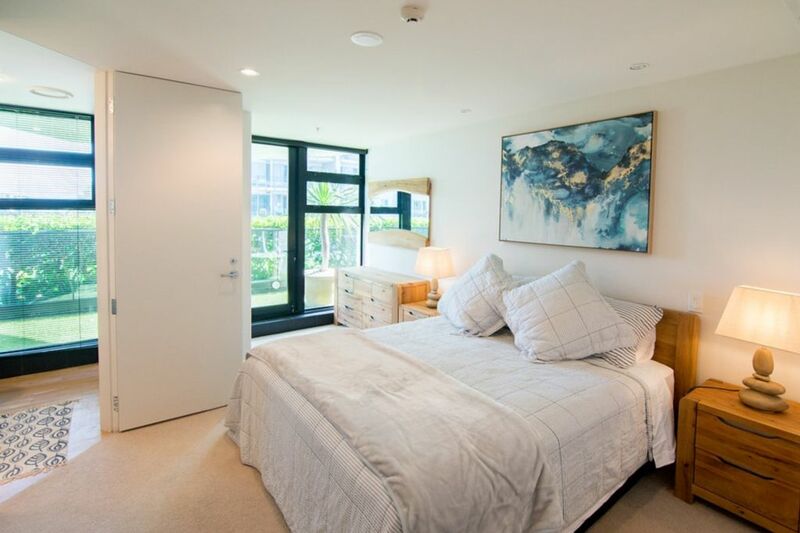 This modern two bedroom apartment is located in one of the nicest apartment buildings in Mt Maunganui and offers a large swimming pool and spa pool on the 3rd level and a gym for your enjoyment.The main surf beach, harbour, cafes, hot pools, surfclub, boat ramp are all within 1 minutes walk. Enjoy watching the crusie ships going out in the evening from Pilot bay. Fishing/diving charter boats can collect you from Salisbury wharf and two golf courses are located within a 10min drive. Tauranga airport is located approx 6kms away. This two bedroom modern apartment has the living area upstairs which opens up onto a deck where you can enjoy the afternoon sun overlooking The Mauao and Pilot Bay. The bedrooms are downstairs, each with there own ensuite. This apartment was absolutely perfect. We brought family down for the weekend to celebrate mum's 80th birthday. So much space for 2 couples, high quality amenities, and meticulously clean too. Would definitely stay again. Thank you for making our stay a memorable one. Lovely modern apartment with great facilities. Easy to access with a great view of the mount and part view of the bay. Great apartment. So close to the Mount and cafes. Apartment was extremely comfortable and had everything we needed (including g some coffee pods and milk). Has a washer and dryer which given that we had been traveling for some days was so wonderful. Indoor parking space was certainly a nice extra as parking in the area is difficult. Great location - perfect place for a weekend break! Great apartment, really enjoyed our time there.